Today’s entry is in honor of a great man, a real gentleman, Bill Haberland who is pictured here with his daughter Nancy. Yesterday started with a morning workout. I followed along with Beach Body’s Insanity Cardio Power and Resistance. Just going through the motions is a great way to get moving; it is never my expectation to keep pace with Shaun T, the leader of this series. After two weeks of falling off my healthy eating regime, this 45 minute regime got me energized. Each Friday for a month now I have been taking ukulele lessons with Ike at his Music Shop. Each uke lesson is followed by a piano lesson with Addie. My progress is slow. Sometimes we talk about music theory, other times we do a 4-measure duet of a popular song. Other times Ike and Addie present me with a technique for skill improvement. Changing fingers as I descend and ascend the fret board is an a needed skill for playing the uke. The same principle applies to the piano, although your hands and fingers are obviously placed in a different orientation. After my lessons I meet my friend Polly for lunch. Polly is my hiking partner. Due to work constraints and my limited days til departure, our hiking days have diminished. Yet our determination to meet again on the trail motivates our individual week day workouts. I returned home from my music lessons. My strength was weakening. Not just my body, but my mind as well. I laid on the couch to watch the blue birds and doves flit about our yard. The phone rang. it was a friend inviting me to a free concert. Without hesitation I got up and readied myself for an outdoor Celtic music festival. After listening to the ear piercing bag pipes, fiddle playing and Scottish brogue singer I retreated to my van. I checked my phone to see the time. On my iphone screen was a message. I clicked on the icon. Tears welled up, it was a message from Gail, Bill’s other daughter, not the one pictured. 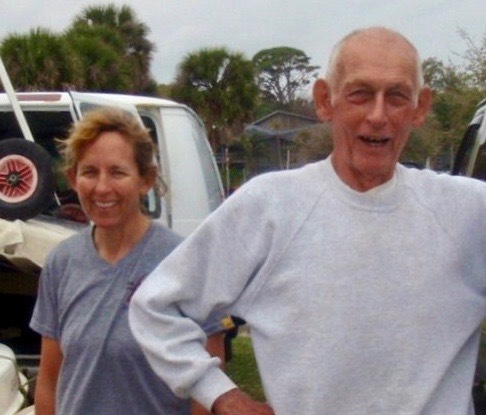 Bill was my sunfish sailing coach, dance partner and dear friend who passed away several years ago. Gail was inviting me to stop and visit on my Florida trip. Tears immediately flowed. I just sat in the driver’s seat and cried and cried. Her dad was a special man, a kind, gentle man who embraced me on an emotional level when my Danny died. He understood the pain of widowhood. He was a true friend, admired by everyone. The fortune of having so many friends welcome me back to Florida is overwhelming. It is turning my fear into what could be the biggest crying jag of my life. Why do we cry? I don’t know, I just know Gail’s message touched my heart in the most endearing reminder of the bittersweet world in which we live.